Gorgeous! All beautiful images but that center shot you choose well, perfect! gorgeous photos! & a hot air balloon ride? wow!! Thanks for the siteseeing in San Diego. Lovely mosaic. We used to live there many years ago and it is one of the most beautiful places on earth to live and EAT at old town.......Beautiful, sugar! You're braver than I would ever be! No balloon for me! Great mosaic! Your mosaic is gorgeous and should be a travel postcard. Just looking at your selection of beautiful photographs makes me want to visit. I would go up in a balloon in a minute. The pictures are outstanding. I love the one you chose for the center. San Diego so full of religious history and atmosphere. Karen hit the nail on the head! This should be a travel postcard. Great shots - well done. What a wonderful mosaic - I love San Diego and you have captured it wonderfully! What a fabulous mosaic of San Diego!!! 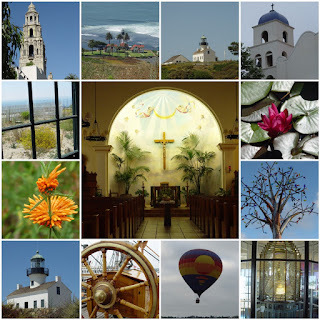 I have not had the pleasure of visiting San Diego so your photo mosaic was such a treat! Ohhh...the beaches look sooo beautiful!!! Your trip sounds fabulous...so many fun and interesting things to do there!!! These photos are just breathtaking! You captured the sights perfectly! I think the hot air balloon ride would be the highlight.... Sounds like you had a great time. Beautiful San Diego! I agree, these could be postcard shots. I love the framing on the captain's wheel. It makes me want to go sailing! Lovely mosaic! We were lucky enough to stay at the Hotel Del Coronado when our girls were young. Lots of fun things to do. Loved the zoo, of course, and the beautiful Point Loma. Great photos! This is a great look at San Diego. The lantern is awesome. Were the lily pads really white?? Lori E. - the lily pads were light green - they look lighter in the sunlight. Thought it was a neat photo, however. Your mosaics just took my breath away. I'd love to visit San Diego. Beautiful. Thanks for stopping by A Day in the Life. I've enjoyed doing the mosaics for the first time today. Your photo collection of this mosaic is just wonderful. How lovely to be in a hot balloon ride! I've been only to a tethered ride in Temecula!